The very fortunate thing about caravanning, RV exploring or camping for the lucky few who get to experience this part of life are the options available as far as caravan accessories available right here in Australia. It doesn’t matter what stage of life you’re at or condition you are in, accessorising your caravan or RV with the technology available these days can allow you to virtually go anywhere at any time safely and comfortably, allowing a lifestyle many people only dream about. If it’s comfortable - It’s enjoyable! Whether your building the dream caravan, renovating the old, or accessorising the new, proper thought and careful consideration can make your adventure a lot more comfortable - which means a lot more enjoyable! If you have not been caravanning before, actively seek advice as it’s those little tips and tricks that caravanners love to chat about that could increase your comfort and save you thousands if you’re not aware. Go online, get involved in the many online caravanning communities to help you plan your next adventure. If there is more than one of you travelling, then applying this simple philosophy to whom ever you are travelling will 110% guarantee a successful trip. Planning for each other’s living conditions will be beneficial to be done together - Even if it means you basically have to put wheels on your existing home! As silly as this sounds, living as comfortably as you would at home really is a possibility with todays technology. A good water setup on your caravan can prove invaluable. The longer you’re away from town water supply the better your setup will have to be. Water Filtration can vary significantly in price as there is a difference in the types of filtration available. Most filters are designed to remove sediment, bugs and bacteria, while additional disinfectant methods may be required to remove or kill other nasties like viruses. Depending on where you will be travelling and the level of filtering required, the right setup will potentially save either your health or the endless water runs to keep up a fresh supply. Non-toxic fit for purpose water hoses and tanks will help to remove bad odours and tastes from your water. Tip: your normal household garden hose is not guaranteed to be non-toxic are more often than not it will literally leave a bad taste in your mouth. Towing mirrors will widen and extend your vision down the whole length of your caravan eliminating the normal deceptive blind spots. A relatively inexpensive option considering the extra safety benefits. Reverse Cameras are a great caravan accessory to allow you to see behind you without the need of a spotter. Great for the convenience if you are parking or maneuvering by yourself. Tip: Caravan parks are renowned for kids running, playing, riding bikes/scooters and generally not really being aware of you maneuvering your caravan. For my own peace of mind and being a parent myself, I consider these more of a necessity than a luxury. Take the hard work out of maneuvering your caravan. There are caravan movers on the market today that can remotely move your caravan into position after you have un-hitched. This allows you to walk around your whole van whilst using a remote control to maneuver you caravan effortlessly into tight spaces. Hatches are the simplest and most cost effective form of cooling. A hatch is basically a window for your roof that can let heat out and sunlight in through the top of your caravan. A fan installed within your hatch can create a cool draft - A relatively cheap alternative to air-conditioning. Tip: always travel with your windows and hatches closed as designed. This will prevent dust, rain and up to 100 km/h winds from entering your caravan. Capacity - match the correct capacity to the right size area. Roof mounted or split system - as a general rule, roof top air conditioners are more suitable on fixed roof caravans for space saving and operating efficiency. Split systems are more suitable for pop tops and campervans. Otherwise to fit a roof top air conditioner to a pop top or campervan, extra support and strut modification may be required which can become expensive. LED lights are the most popular lights for the caravan industry. They are generally smaller, brighter and most importantly more efficient compared to the traditional incandescents, halogen and fluorescent types. Generally more expensive initially, but longer life and better effiency more than make up for this in the long run. A typical caravan fridge or RV fridge can be powered by 12 volt, 240 volt or gas making them fit for purpose when travelling. A 3 way absorption fridge is one that can powered by any one of the three options and operates silently due to the absorption technique. The absorption technique does not use a compressor and works by converting a liquid ammonia solution to gas and forcing it through the internal fridge components. The changing state from liquid to gas and gas to liquid creates a temperature differential which is harnessed and channelled to the inside of your fridge to keep your food and drinks cool or even frozen. A heat source is needed to turn the liquid to gas, so the 3 way fridge can use a gas pilot light or a 12 or 240volt electric element to heat this solution. Whilst you have the versatility of using gas or electricity to run your fridge, powering a 12volt or 240 volt element is not as energy efficient as powering a 12 or 240 volt compressor to operate the fridge. The effeciency and convenience of using gas coupled with the backup of using 12 or 240 volt power when necessary is the reason why these fridges are popular in the caravan and camping industry. A compressor type caravan fridge is a little easier and cost effective to install as it requires less ventilation to operate. It is generally considered to be more effective in cooling as it can pull the fridge temperature down quicker and with less power consumption than a 3 way absorption fridge. 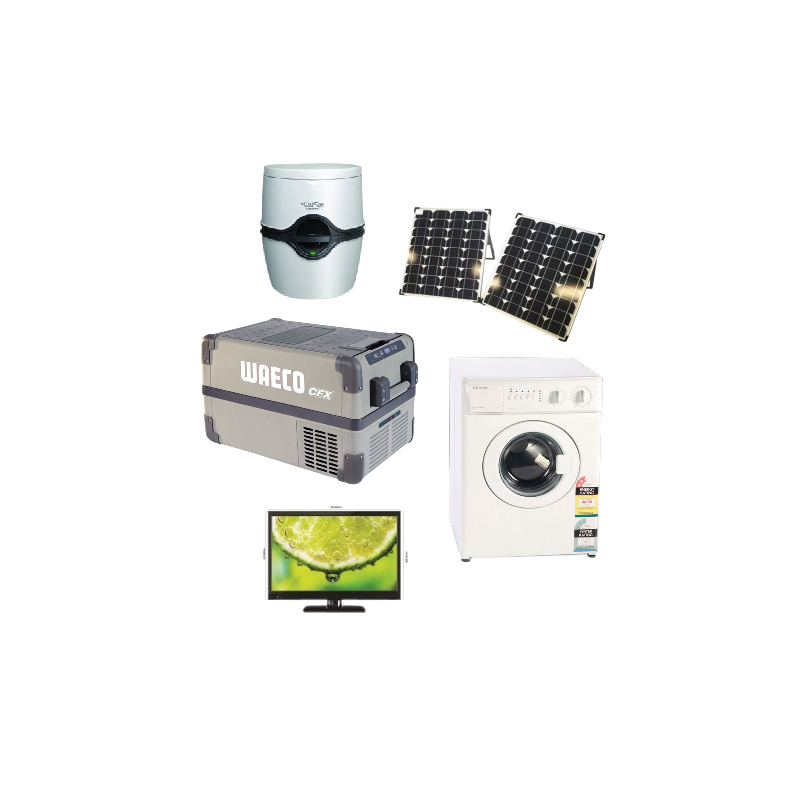 You will not have the added convenience of running off gas, although with the advancements in compressor fridge technology and solar and battery setups, running a compressor type fridge is becoming much more practical. If you don’t need huge amounts of fridge space, smaller portable fridges are very popular as they use less power and can be set up where ever you like in your camp area, caravan, RV or car. Awnings and annexes are great for easily extending the living area of your caravan or RV. Roll out awnings are designed to be set up within minutes to provide an instant patio for your caravan or RV, ideal for shorter stays. Annexes are designed to fully enclose your extra living area, effectively doubling the size of your caravan. These take a lot longer to set up, but are ideal for longer stays. If you’re staying at a powered site in a caravan park, then you don’t really have an issue with power and can basically live with all the modern conveniences and power all of your caravan accessories to feel like you’re at home without any dramas. Free camping is the cheaper alternative in the long run but will require a well thought out plan to make sure you have enough power generation for the appliances you want to run. Power supply - solar panels plus generator. Power storage - AGM batteries. Appliances - fridge, freezer, TV, stereo, lights, phone charger, washing machine, air conditioners and fans. For the safe use of gas in the home, caravan or RV, a gas fuse can easily be fitted to your gas bottle which will shut off your gas supply in the event of an emergency or major leak. This relatively inexpensive, clever device will also indicate your gas level saving you money on unnecessary bottle swaps. Caravan accessories are great if you can use them, unfortunately no one but yourself can guarantee the safety and security of your personal items whilst on your adventure. Removing the temptation for opportunistic thieves is 90% of the battle. Simple relatively inexpensive locking devices like, doors, screens, compartments, lockable jerry can holders and tow ball/hitch locks are enough to deter the common thief and are considered cheap insurance compared to the value of your items.